How do you get teens to clean their rooms? This is a big struggle at our house right now. Do you have any suggestions? I believe that some children are naturally tidy and others are not. We have both kinds in our own family. I myself was a messy child but am an organized adult — so I try not to lose hope when I can’t find the floor of my child’s closet for all the wet towels he has dropped there. Still, those towels may mildew if they don’t find their way to the laundry, so how do we make sure that happens? 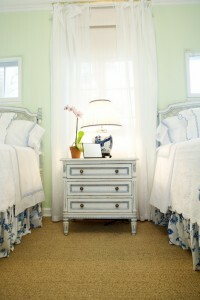 Make it as easy as you can for your children to keep their bedrooms clean. Identify the problem areas, then think of a solution. If the dirty clothes pile up in the floor of the closet while the bathroom hamper stands empty, move the hamper to the closet. My oldest daughter would come in from college every afternoon and drop her backpack on the floor of her bedroom, so I put an empty blanket chest at the foot of her bed, and now she drops it in there (most of the time). You must clearly define your standard (and possibly even consider lowering it). I would love for my children to keep their rooms 100 percent clean, 100 percent of the time — but I’m content when they keep their rooms 85 percent clean with some consistently. I can ignore cluttered drawers if the beds are made neatly. When their bedrooms need a little extra attention, I give them a checklist of what needs to be done, so we both stay on the same page. Be sure you are modeling good behavior yourself. I’m much more likely to get upset at the papers scattered all over my son’s desk if the files on my desk are overflowing, so while I ask him to clean his, I work on getting my own back in order. Our children learn much more from our example than from our instruction. I think the real reason my home is clean and organized today is that my mother was such an immaculate housekeeper when I was growing up. Come alongside your child — at every age — and give patient, loving help when they need it. Even teens get overwhelmed by what seems to be a hopelessly cluttered room. They feel stressed out and don’t know where to begin, just like younger children (and even mothers!) sometimes do. I still get a warm tingle down my spine when I think of all the times my mother rescued me when I got bogged down with the burden of tidying my room. She’d sit down at my desk and say sweetly, “How about I organize your drawers while you clean out your closet?” Then she’d visit with me while she separated paper clips from rubberbands. It was heavenly. If you’ll do these four things consistently, your teens’ rooms may not look perfect, but they will at least stay presentable. What’s more, by keeping their space in order, your children will learn good habits that will serve them well in all of life. Readers? What works best at your house for encouraging children to keep their rooms tidy? Please share your ideas in the comment section below!